Mayor orders closure of petrochemical plants after study showed pollutants causing disproportionately high cancer rates. The mayor of Haifa, Israel's third largest city, ordered Sunday the closure of five petrochemical plants following a health ministry warning linking high cancer rates to air pollution. Haifa Mayor Yona Yahav further said that municipality trucks were blocking the entrances to Israel Oil Refineries and Petroleum & Energy Infrastructures, both of which are based on the bay in the northern port city, AFP reports. "From now on, no tankers will have access to the factories," he said in remarks relayed by his office, which said five factories had been ordered to shut down. The move came after a senior health ministry official sent a letter to the interior ministry's planning department warning of a disproportionately high cancer rate in the Haifa area due to the operation of such plants. Written by Professor Itamar Grotto, head of the ministry's public health services, the letter quoted Hebrew University research published in the American Journal of Cancer Epidemiology and Prevention which found "an increased risk of developing cancer in a heavily-industrialized sub-district" of the city. The letter was submitted as part of an appeal against plans to expand oil refineries in the area. "Compared to the incidence in the rest of Israel, the Haifa subdistrict population had an elevated hazard ratio of lung, head and neck, colo-rectal, gastric and oesophagus, bladder and cervical carcinoma," the researchers wrote. "If the latest data is correct, we demand an immediate halt to all operations of the polluting factories in the Greater Haifa area," Yahav said. The environmental protection ministry confirmed the Haifa Bay area "ranked first in pollutant emissions in Israel" while noting that the research was based on data from a decade ago and there had been "a 70 percent drop in air pollution" in the bay area over the past six years. 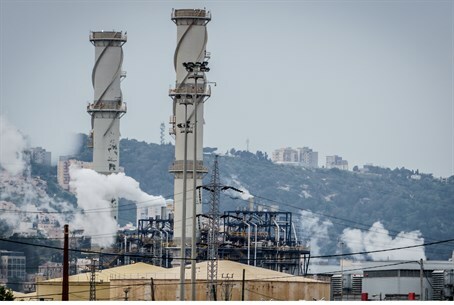 In a statement, Israel Oil Refineries said it had invested over one billion shekels ($255 million/236 million euros) in "preserving the environment and diminishing pollutant emissions." The company, which describes itself as Israel's "largest integrated refining and petrochemical group," said "objective bodies" had measured "dramatic improvements" in pollution levels.